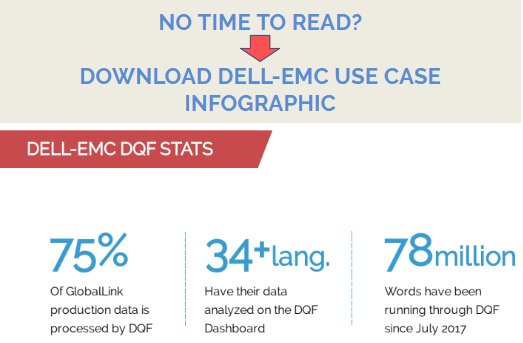 Use Case: Dell-EMC produces high volumes of translated content – more than 200 million words in more than 34 languages and dialects annually using four different vendors. Since July of 2017, 78 million words have run through the DQF integration, with plans to have all volume flowing through the integration within the next year. As the industry is getting closer and closer to adopting the TAUS Dynamic Quality Framework (DQF) as a standard for evaluating translation productivity and quality, we’ve decided to talk to the heads of the translation department at Dell EMC about their experience with using DQF. They are a long-time supporter of the vision behind TAUS DQF and, since July 2017, an active user of the DQF integration with GlobalLink (provided by Translations.com). Dell EMC produces high volumes of translated content – more than 200 million words in more than 34 languages and dialects annually using four different vendors. Since July of 2017, 78 million words have run through the DQF integration, with plans to have all volume flowing through the integration within the next year. In addition to that, they work with different content streams and differentiate between several content types, most of which they apply machine translation on. Out of the total generated translation volume that runs through GlobalLink, ~75% of the production data is currently being pushed through DQF and analyzed on the Quality Dashboard. The realization that the LISA QA model they were using was outdated and didn’t take into consideration the differences in content type, purpose of content or its audience, prompted Dell EMC to seek another solution. Their production reality asked for a multi-faceted evaluation method - one that would not treat all content the same or be mainly focused on the linguistics. And they needed this solution to also track data on translation productivity and edit-distance so that they could evaluate efficiency of their machine translation engine output - at scale, in real-time. The capability of DQF to account for various content types, thanks to its range of advanced evaluation metrics, fulfilled the need for a more dynamic framework. At the same time, an even bigger driver for adoption of DQF was the need for alignment - both internal and external. The importance of sharing the same view on quality and the same metrics across the supply chain became apparent with the merger of Dell and EMC, as the teams from the two companies were brought together. Moreover, DQF offered the ability to benchmark across the industry, speaking to Dell EMC’s desire to share a single, industry-wide view of how quality is being defined and measured. Currently, Dell EMC mainly focuses on the productivity and benchmarking data from DQF. Based on the productivity data that they have analyzed so far, they were able to perform vendor feedback validation on the perceived quality of the machine translation output. In a situation where a vendor raises a question about a seemingly low output quality, they can resort to DQF data and use it to analyze and validate their feedback and avoid arguments: “You need to look at numbers and not impressions”, explains Georg Kirchner. With the numbers from DQF benchmark reports, they can even go a step further as to establish a high-level productivity degree per language pair. Next to the automatically produced, high-level reports, DQF allows one to download the actual content that was submitted for analysis. These downloadable reports include the text from before and after the post-editing and help obtain detailed insights that one otherwise wouldn’t have. For Dell EMC, this possibility enabled them to identify a bug in their MT framework and resolve it timely. DQF came as the first choice for a couple of additional reasons: a) Dell EMC have been a long-term member of TAUS and have participated in the discussions that led to establishing and shaping the Dynamic Quality Framework, so they were familiar with the vision and the mechanics behind it; b) the potential alternatives did not cut the mustard - the options were to either stick to what they had before or build their own solution that wouldn’t tick all the boxes as the industry standard. As Georg Kirchner pointed out: "The only alternative you would have is to compare yourself against yourself, and that is not terribly interesting." From the Dell EMC perspective as a buyer, moving to DQF was a great fit for their purpose. The implementation effort is not big and they have the buy-in from all of their vendors, who also see the value in accessing the data. The democratic nature of the model, allowing everyone to see the same data, means that the conversation around pricing becomes less painful, more data-informed and fairer all around. Mark Brayan: In a technology-driven world, what will Act 2 be for the language industry? Milica holds MAs in Dutch Language and Literature from the University of Belgrade and Leiden University. Her background is in localization, project management and content marketing in an e-commerce environment. She is passionate about continuously inventing new ways to teach languages. She joined TAUS as the Product Marketing Manager, responsible for TAUS website development as well as the product marketing efforts.